When inspiration or a sense of responsibility hits me I'll jot down a note or sketch something out with whatever means are available. If I'm at work I'll send myself a to do list or a link to check out later in an email message. When out of reach of digitial devices, post it notes, scraps of paper, and the highly-versatile cocktail napkin receive the rest of my scribbles and scratches. Now if I could just remember where I've squirreled away these bits of brilliance. Enter Evernote , a new service to help you collect and manage your mental notes in each of their forms. Evernote allows you to send and store notes in text, image, and audio format through a variety of methods. 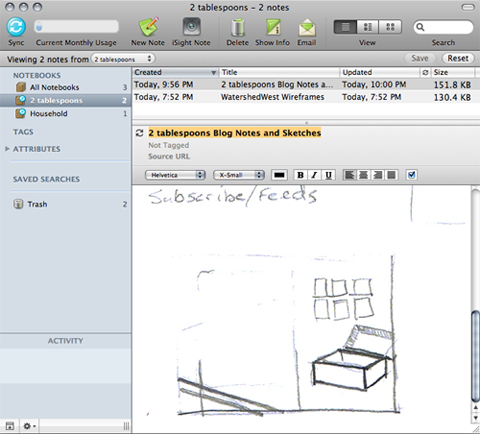 I had signed up for a free account last month but hadn't had a chance to take Evernote for a spin until tonight. It's easy to to get up and running. Submit notes through a web interface, your very own Evernote email address, desktop clients for Windows and Mac, or through mobile clients, including one for the iPhone. Create Notebooks to group your notes, add tags, and browse notes in either thumbnail or list views. Each Evernote account comes with a custom email address. Save this address to your desktop and mobile device to send text notes with photo or scanned attachments. Subject titles are used as note titles and Evernote seems to do a good job retaining message format. No worries about spam here since Evernote account addresses are sufficiently randomized. I was hoping that I'd be able to rotate the image attachment shown below, but alas image rotation doesn't appear to be a feature yet. This was the only shortcoming I found with the service. Evernote provides Mac and Windows users with handy desktop clients. Unfortunately Mac users with less than Leopard are left out. The client allows you to easily create and format new text notes, screenshots, clipboard contents, and iSight pictures. You can also keep notes in sync locally for offline viewing and search. I was a bit skeptical of how well Evernote's OCR capabilities would work, especially with handwriting as poor as mine. I am blown away at how well Evernote's hand writing recognition worked. Keywords found in images are highlighted nicely as shown with the following 'FTP' search result. 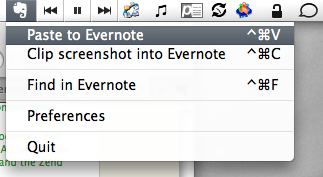 Overall I'm really impressed with Evernote. I plan on piling my notes near my Brother multipage scanner for periodic capture and posting. No more rifling through piles of paper for me. Give it a try and see what you think.